In the summer of 1986, I saw a movie that changed my life forever. Like so many others in our country and all around the world, I had lost that love and feeling, but watching Maverick and Goose guide Cougar’s F14 safely onto their Naval aircraft carrier gave me a shot of inspiration that I had never felt before. That’s right, at six years old I was dead set on a becoming a Naval Aviator, and going to Top Gun. Cut to present day, I am a thirty eight year old writer/producer, not a Naval Aviator, but I did just run along the same beach our Navy SEAL’s train on, so I didn’t veer too far off track. I raced in the Ironman Superfrog 70.3 triathlon last Sunday in Imperial Beach, CA and it was my favorite race to date. Actually, that’s not quite right, the 5 hours and 2 minutes that I was swimming, biking, and running was very fun, fast, and memorable, of course, but it was what happened in the hours leading up to the cannon going off, and the hours after I crossed the red-carpeted finish line that truly made it special. My grandfather, AKA, Grandpa Eddy, was a graduate of the Naval academy, class of 1933, and he fueled my passion for years to pursue my dream of becoming a pilot and attending the Naval academy. He mailed me articles from the school newspaper, and gave me a USNA sweatshirt that I wore rain or shine nearly every single day between the fall of 1988 and the Summer of 1990, as I feverishly planned to become the first woman to fly the B2 Stealth bomber. However, as I grew into my teen years my passion for filmmaking overwhelmed my childhood dream of one day having a call sign. Also, I was terrible at math, and my eyesight wasn’t perfect, (necessities to become a pilot). Clearly, the universe had other plans for me. In the summer of 1996, when I was sixteen, Grandpa Eddy passed away. Regrettably, I didn’t visit him one last time when I had the chance. I always felt that the Navy was a special connection I had with him, (none of my siblings were as obsessed with it as I was,) so when I think of the Navy, I think of Grandpa Eddy. Therefore, when I started looking for fall triathlon races leading up to Ironman Arizona this November, Superfrog’s late September timing seemed perfect. I already knew the race had a connection to the Navy, as it was started by a Navy SEAL named, Moki Martin, in 1979 in order for fellow SEAL’s to train for the Ironman race in Kona. I thought the race looked cool, but when I learned that a hefty portion of the entry fee went toward the Navy SEAL foundation, I signed up right away. Photo courtesy of Johnna Boylan. I will never forgive myself for not giving Grandpa Eddy a proper good-bye, and I will never stop trying to make up for my mistake, but I thought racing alongside Navy officers, (and the other armed forces), was something he would be proud of. I am sure that many people wonder why we choose to physically, mentally, and emotionally exhaust ourselves during training and racing, so I replied, “Great question! I believe racing is a metaphor for any other uncomfortable situation in life where we have to figure out how to make it through the challenges and find solutions.” I also enjoy the pursuit of being fitter, faster, and stronger than my peers, but that comes secondary to what competition does for my heart, mind and soul. I was in bed by 8:45P, asleep by 9:00PM, and wide awake at 4A. Perfect. I also saw Peter and Jinx numerous times on the four-loop bike course as they set up chairs along the 75 highway to cheer us all on. Thank you so much!!!! Another special part about this race was that I would be racing with my teammates. I had never met any of them in person, but I already felt connected by our many interactions on social media. Still, nothing is better than the real thing, so it was great to give hugs and high fives to these fellow nutty triathletes before the race. Chatting it up with my teammate, Barry Plaga. Photo courtesy of Johnna Boylan. 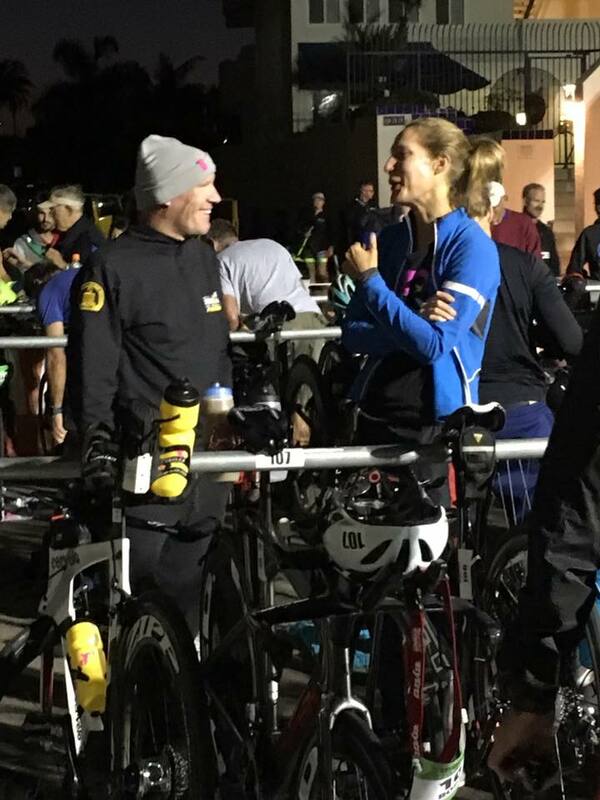 There is a certain twinkle in every TeamHPB athlete’s eye that always makes me smile, because we share a dedication to our goals that allows us to take on and withstand the most rigorous and focused training given by the top coaches in all of triathlon. My teammates are the best of the best, because we are coached by the best of the best; TeamHPB is the triathlon version of Top Gun. And guess what? Our very own Viper was going to be at the race cheering us on. Yep, Hillary was there with her fabulous family in tow from the start of the swim until after we had all crossed the finish line. It’s funny, I thought I would be nervous knowing she was there watching, but I wasn’t, I was relieved. She knows my training and overall triathlon story and goals better than most, so I felt comforted and simply happy to have her there in person to witness how her hard work and dedication was starting to pay off. Post-race rundown with my teammates Tori Fewell and Barry Plaga. Photo courtesy of Hillary Biscay. The race started off on a great note because the swim course was originally a two loop course swimming clockwise, however, since the current shifted, they changed directions, so we swam counter-clockwise instead. I had my fair share of swimming against a strong current during the Pier to Pier swim, so I was thrilled with this decision, embraced the help from Mother nature, and body surfed my way to a personal best time, 30:18 minutes. The bike course sent us on four flat loops up and down the Silver Strand Highway, 75. I started out strong, but felt slightly out of sorts on the first lap, but then found my groove and slayed the next three. The last month or so of training has been very informative about the range of watts I should hit for my half ironman, and ironman paces. I have had hits and misses for both, riding too hard, and too soft, but I was clear on race day the range Hillary wanted me to hover between, and I achieved those watts just fine. I rode the 56-mile bike course in 2:35:49 hours, a quick time for me, and for most ladies it turned out. Hilariously, I over shot my rack spot running into transition, so my diligent pre-race practice going from my bike shoes and helmet, to run shoes and visor didn’t really help my time too much. Oh well, work in progress. However, when I realized the gravity of the run course, I knew those extra seconds lost in transition would make zero difference at all. In the few days before the race I started to research the course, and noticed that we would be running on sand for a portion of the race. It was a four loop course, so I thought maybe a total of three miles or so would be on sand. Nope. Nearly 80% of the course was on sand. I am not kidding. That means we ran about 8-9 miles in hard, soft, uneven, and crowded sand. It was silly tough. Miraculously, I had a crucial mental card to play that my competitors did not, the memory and mindset of climbing Mt. Alyeska during Alaskaman. I tapped into that dark, determined part of my brain to focus solely on moving forward during our time on sand, and then opening up my stride and quickening my pace for the precious mini-sections of hard surfaces we did get to run on at the end of each loop. I moved through the crowd faster and less frustrated than my competitors because I had survived much worse. Finally, I earned a positive gain from my horrible run in Alaska. I sprinted to the line in shock, I was not expecting to be third, but was beyond thrilled. Especially since after I collected myself I noticed a very special one-year old yelling out across the barricade, “Go, T!” Well, actually she wasn’t yelling that, but her mom was, my coach, and to have Hillary see me finish that well was amazing. Hillary's daughter, Madison, spent her first birthday cheering her heart out for all of us! The top 3 women posing with the original race director, and legend, Moki Martin. It turns out I placed 1st in my 35 – 39 age group, too, so naturally I stuck around the next few hours for the awards ceremony. It was great because all of my teammates raced well, which meant we all had reasons to stick around for the awards and in turn to spend a bit more time together. Yours truly with my teammate and Super -Swimmer and Biker 25-29 age group 2nd place finisher, Kelly Motley. One of the cool parts about placing 1st in my age group was that I earned a slot to the Half Ironman World Championships being held in South Africa next September. However, I want my main focus next year to be qualifying and racing at the Ironman World Championships in Kona, HI, so I decided to give up my slot to the race. If the race setting was more geographically desirable, I would’ve taken it, but South Africa is a little far away for that to make sense. Even if my boss, Tyler Perry, decided to help out his top-notch VFX producer with a sponsored trip to South Africa, Hillary said the turn-a-around to execute both races well would be too much, so I gave up my slot with a clear conscience. What I did not expect, since I was locked in a self-centered post-amazing race haze, was how my decision would affect someone else. She grabbed my hands, and shook them heartily in hers. It was a spectacular moment, I knew I made a great decision, and believed in that instant Grandpa Eddy was proud of me, and was smiling from above. I made a quick, but wonderful visit to San Marcos to see my sister, Mary, and my nieces, Darby and Teagan. Luckily, my first place trophy helped justify my tardiness.